Over at Diário de Notícias, Jose Fialho Gouveia has published another article on Germany, Schulz, and all that jazz, once more with a couple of my cents added. 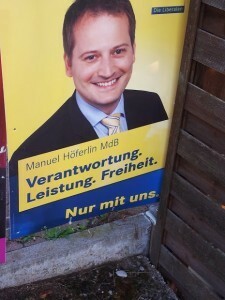 By the way, don’t you just love the imagery of beer jug hefting German politicians? If you’re interested, here is the English transcript of our chat. At the moment, the SPD and the CDU/CSU block are neck-on-neck. But six months away from the election, many voters are undecided or may change their mind further down the road. Historically, the SPD has only twice surpassed the Christian Democrats (in 1972 and 1998). So it is possible that SPD gets more votes than the CDU/CSU combined, but I would not bet on it. At the end of the day, the more relevant question is who will be able to form a winning coalition in parliament. 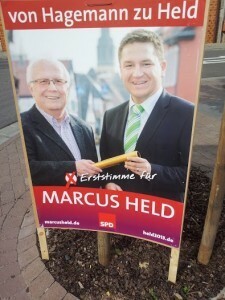 If the SPD actually gets more votes than the Christian Democrats, that is entirely possible. 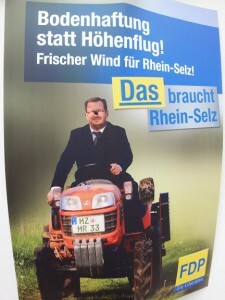 In a sense, Schulz is attacking the previous (post 2002) reform policies of his own party. He also tries to benefit from the fact that Merkel has been in office for a long time, and that some voters are tired of her (not so much of her policies). Schulz and the SPD are focusing heavily on “justice”, in particular “social justice”. He is also attacking right-wing populism. Whether this will be enough to propel them through a six-month-long campaign is a different question. Those old enough to remember that Bill Murray had a career before Lost in Translation (or to remember Bill Murray) will instantly recognise this scene: Punxsutawney Phil is predicting six more electoral cycles of political misery for Germany’s Liberal Democrats. Granted that the animal is a bit on the small side, but first, This is not America, and second, the choice of rodent is rather apt: Aren’t we all guinea pigs when it comes to policy making? 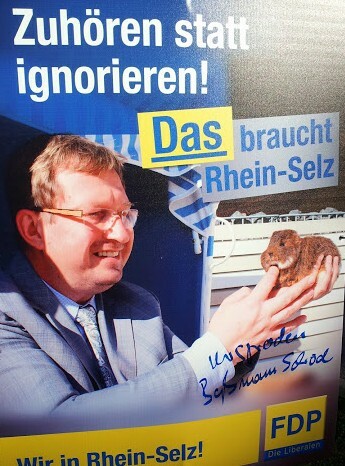 The hopeful candidate molesting the furry bugger promises that he will listen, not ignore (whom?). He might change his mind once the beast sinks its front teeth into that yummy finger. 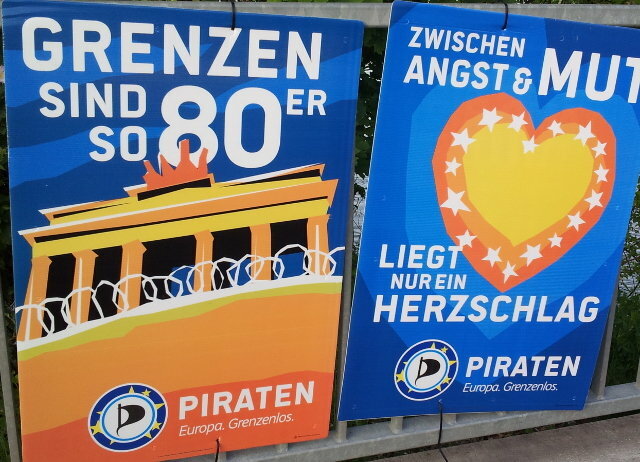 The Pirates are running a rather cheap electoral campaign: No faces (models or not) but only drawings in their trademark orange/blue tones. Their stinginess even extends to the meaning of their slogans. I was a bit thrown off by “Borders are so 80”, then discovered the small “er”, so borders are so 1980s, apparently. Well, yes, I get the implication for Europe. But why is there a “Herzschlag” (heartbeat? or heart attack???) 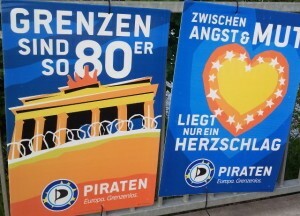 between fear and courage, and why would that make me vote for the Pirates? I have a feeling that Literal Campaign Video Clips might become a thing very soon. There may be a European election on, but around here, the big one is the local elections. In the plural: On my last count, I will have to vote for town mayor, town council, municipal mayor, municipal council, district council and perhaps even leader of the district council, though I’m not 100 per cent sure re the last one. Important as they may be, local elections are the domain of the amateurs, as the old saying goes amongst German Political Scientist.1 To make things slightly worse, councillors are elected under an open list system (with not threshold), so there are some incentives to cultivate a personal vote, and quite some margin for error. So far, I have spotted few real howlers but then the Liberal Democrats (FDP), wiped out in the last Bundestag election and poised to do badly in the EP2014, decided to go for this year’s Bad Pun Award. 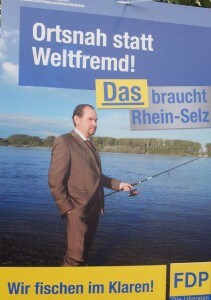 So the guy on the poster is literally fishing (or at least holding a rod while wearing a suit) in clear water (im Klaren, which, if you push it, could be read as a pun-within-the-pun on alcohol), as opposed to fishing in murky waters (im Trüben fishen). The latter used to mean “cheating” but has also acquired connotations of being lost. Say what? But there is more. The candidate is also “ortsnah” (local, in a technical sense that never, ever applies to persons), as opposed to “weltfremd” (unworldly, stuck inside an ivory tower). One might argue that, on some level loosely attached to logic “ortsnah” and “weltfremd” are not exactly opposites but rather awkwardly related concepts. But quite possibly someone sensed a tension between “ort” (the local place) and “welt” (world) and decided that nothing says “local guy” quite like a misguided rhetorical flourish. With PR guys like this, who needs political enemies? I’ve made that one up. Here is another gem from my ever growing collection of slightly leftfield campaign posters. 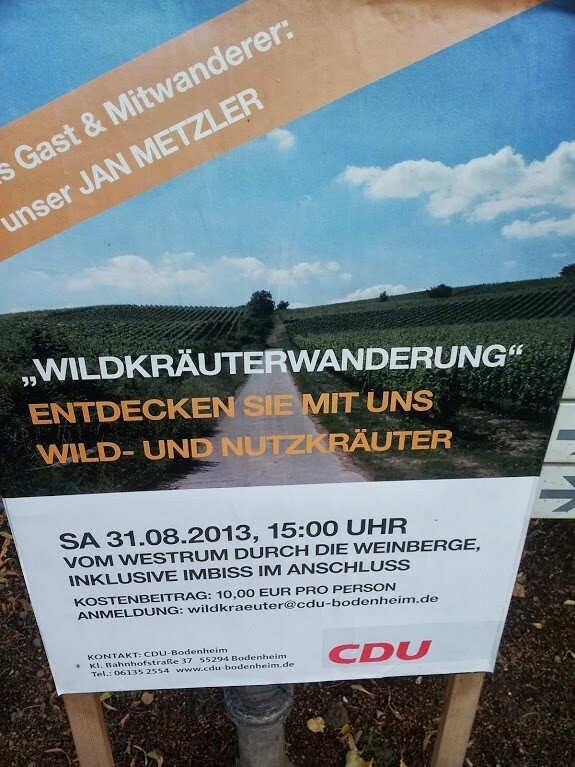 While the world is debating Syria, the local CDU chapter and their supporters take a walk to discover local Nutzkräuter (really useful herbs) and Wildkräuter (wild herbs, which must be potentially useful too?). The long-suffering candidate will tag along. Seriously. I bet all this weed is going to tilt the electoral balance. 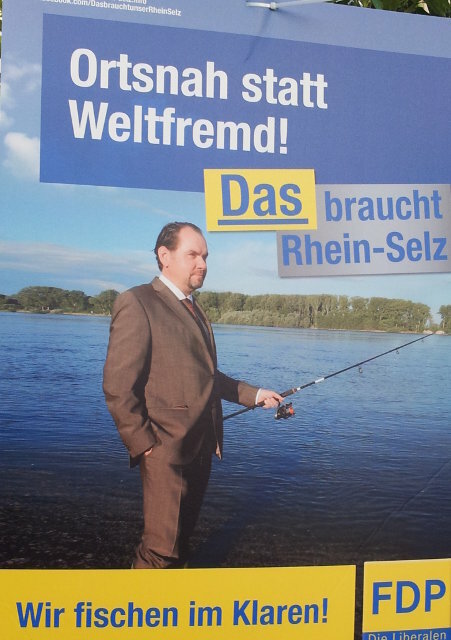 As an aside, note that all local CDU poster refer to “our” (unser) candidate, presumably because nobody ’round here knows the poor man. As we know from Political Communication 101, emotions rule, and help rule. Faith, hope, and charity remain essential tools for any orator worth his/her salt. Cute animals are ok, but cute children are way better. If you can use them not only to create a fuzzy feel-good factor but to deliver a substantive message, you have hit campaign gold. And by the way, this is the 21st century, so being a little subtle does not hurt either. This short video produced for the centre-right, pro-Euro ND is therefore a little gem. During the first few seconds, an eager pupil rattles off the name of various European countries, and a very pleased-looking teacher states the obvious: they are all in the Eurozone. Then, the adorable little girl drops a bombshell: “Why not Greece?”. Our teacher remains silent. Everyone is silent. And the girl insists: “Why, Sir?”. More silence, then cut to message: We must not gamble with the future of our children (and therefore vote ND). Everything about this spot is done so well that one could use it in class. The kids are squarely in the right age bracket: neither scary teenagers nor dumb toddlers. Their expression is exactly in the middle between incomprehension and accusation. I love the attention that was given to details: Included in the list of future Eurozone members are Spain and Portugal. If they could make it, why couldn’t we? And the teacher’s face is priceless: pain, shame, and perhaps guilt, because he failed to do the right thing back in 2012. The most intriguing thing is that so much is communicated in a pitch-perfect way without naming names. Rather conveniently, the spot also fails to mention that the Grand Coalition could have lasted until autumn 2013, and that Greece is now in such a pickle because ND insisted on having early elections. It makes you wonder why a country that is so good at selling politics cannot do politics. address. A simple re-boot of a router would allow this. turnout of 49.76% (which is apparently very high for a Parish Poll). Bandwagon effects. But seriously, would you vote in favour of waste processing plant because the yeas have a 10 point lead, and you want to be with the winners? Would you believe that anyone does? Tactical voting. A more credible motive in principle, but that would require more than two options on the ballot. Paradox of voting. We all know that no one should vote anyway, but if you believe that the other side is going to win, your probability of abstention might go up even further. If the poll was rigged, that would seem to be the most plausible rationale behind such a plot. Apparently, it did not work in Devon. But the more general question is: Can we trust those non-scientific polls, and what is their effect on voters? I think the answers are “No”, and “We don’t know”. But what is your take on the Devon incident?